I have always been a colorful person when it comes to trying different makeup looks on myself... right from bold colored statement eyeliners in the shades turquoise, neon orange, parrot green, grey, blue, khaki green, copper, silver and golden.. I have worn almost all bold colors on my eyes and thus my eyeliner collection is pretty decent. And the same is true with my lipstick and lip-gloss collection. I try to get my hands on all bold colors as and when I can. However I have always remained apprehensive about experimenting with my hair color owing to the fear of those laden with strong and harmful chemicals. Few weeks ago when people from the brand Godrej contacted me and expressed their interest in sending me their new Multi-Application Pack of "Godrej Expert Rich Crème Hair Colour" which is ammonia-free so saves your hair from damage and instead contains goodness of aloevera and milk proteins which gives that extra dose of dekhbhaal to my hair. I simply could not refuse and accepted to try the product. 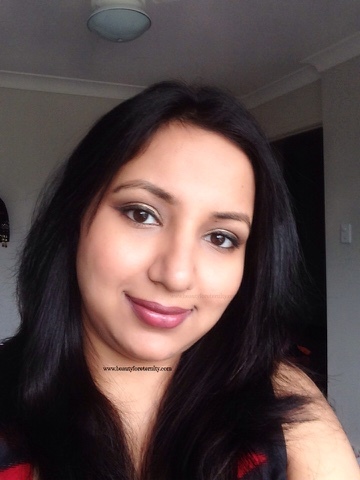 I am going to share my experience of using the product along with some useful tips which will help you to colour your hair like a pro at your own place. 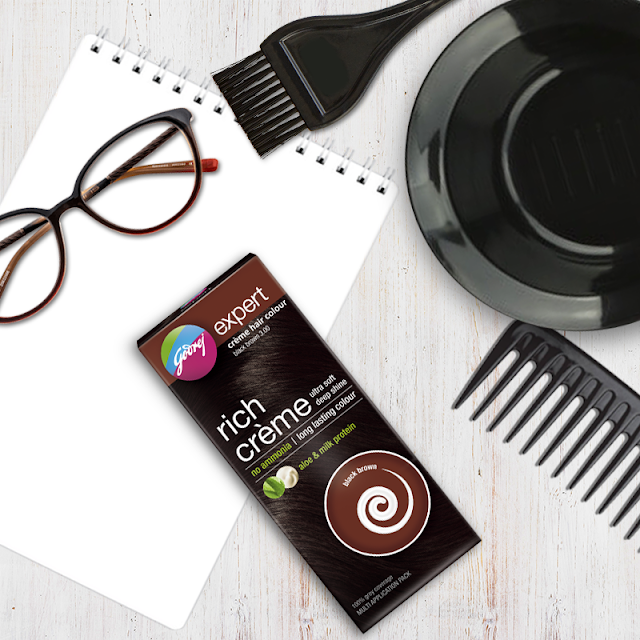 Godrej Expert Rich Crème Hair Colour comes in five gorgeous shades which are - Natural Black (1.00) , Black Brown (3.00), Dark Brown (4.06), Natural Brown (4.00) and Burgundy (4.16). My hair colour is natural black so I thought that the shade Natural Black could make my hair more black so I chose the shade Black brown to colour my own hair. 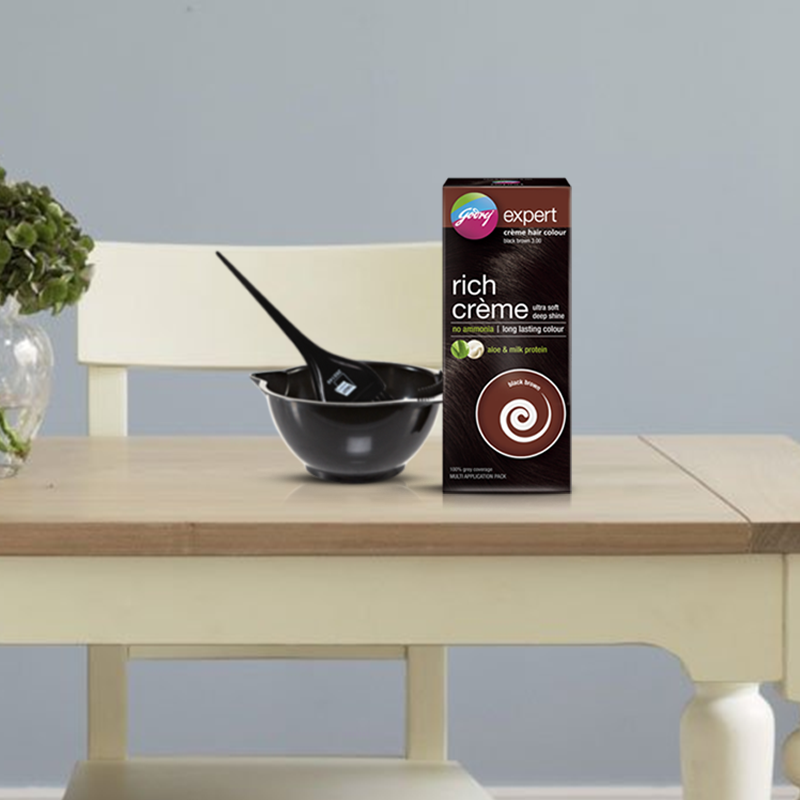 Single application sachets are pre measured and fuss free as you don't have to worry about mixing the contents of the product in correct proportion. These are suitable for small and medium length hair and for doing touch ups. I did a patch test with the product to see if it caused any discomfort or allergy to my skin before actually proceeding with the colouring process and I did not feel any adverse reaction. I wore the gloves to protect my hands and mixed nearly half of the contents (crème+developer) of the multi application pack in a plastic bowl and while mixing I did not feel any pungent smell unlike other hair colouring products which I have seen people using. This is because the product does not have any ammonia in it.The smell actually felt pleasant to my nose. I then combed by hair and started applying the colour on the grey hair in my head with the help of a brush. I do not have too many greys but quite a few at my crown area and wanted to cover those. After making sure that I had covered all the grey hair I could spot in my crown area, i waited for 30 minutes as instructed on the leaflet that came inside the packaging. After 30 minutes , I washed my hair with shampoo and used the conditioner that came with the Godrej Expert Rich Crème Hair Colour. My wet hair felt really soft and manageable and after drying also I could easily feel that softness and shine in my hair. The grey hair were covered really well and looked natural at the same time. It's been nearly 15 days and the colour looks same as day 1 despite of me having washed my hair 5 times in these 2 weeks. 2. Never forget to read the instructions that come with the product. 3. Always wear gloves to protect your hands . 5. Use petroleum jelly along your hairline to prevent staining of the facial skin. To sum up, I would like to say that I really liked the Godrej Expert Rich Crème Hair Colour as it's easy to use, affordable and contains aloevera and milk proteins to give that extra dekhbhaal to your hair. It covered my grey hair beautifully. It's ammonia free and non-damaging to the hair. However I highly recommend you do a skin-sensitivity test prior to using this because we all react to things differently.